This is a complete set of 5 pieces dated 1993. All come with their original boxes. The four members of the Bearinger family are Mama, Papa, Abearnathy, and Bearnadette. 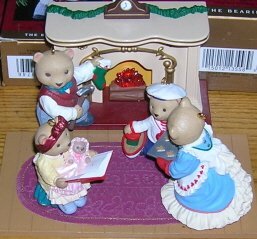 All are gathered around the flickering flames in the fireplace, which takes 2 AA batteries to light. Unless noted above, all ornaments are in very good to excellent condition, and the boxes have no rips or other major damage.